From November 27 through December 2, 2005, more than 26,000 radiology professionals attended the 91st Scientific Assembly and Annual Meeting of the Radiological Society of North America (RSNA 2005). Nearly 700 companies exhibited a full range of radiologic products. The January 2006 edition of this column presented some of the news from the show. This column highlights a small sample of some of the other innovations exhibited in Chicago. TeraRecon (San Mateo, CA) introduced its enterprise-class 3-dimensional (3D) server, AquariusNET VLE, at RSNA 2005. Designed to address the increasing demands for 3D postimaging processing in large, integrated hospital networks, the AquariusNET VLE is capable of concurrently reconstructing up to 30,000 images with real-time performance. Its rendering engine consists of quadruple 4-Gigabyte TeraRecon VolumePro 1000 rendering boards. The company also introduced EliteAccess, which combines the AquariusNET thin-client with the Aquarius Workstation to provide access to both workflow-optimized tools and high-end workstation applications through a single thin-client user interface. The AquariusNET Server solution delivers distributed 3D visualization capabilities throughout the enterprise using the facilities' network. To activate 3D functionality, users download a thin-client application from the server to any number of personal computers (PCs) located anywhere within the enterprise. Users can also access the system from outside the facility using a virtual private network (VPN) over broadband Internet or a wide area network (WAN) connection. "Every day, physicians need to review more volumetric studies in more locations, and in an ever-decreasing amount of time," said Chief Operating Officer Robert Taylor, PhD. "New technologies, such as the AquariusNET VLE Server and EliteAccess, deliver unmatched processing power enterprise-wide, with convenient access to the full range of advanced clinical applications." The company formerly known as 3TP Imaging Sciences (White Plains, NY) reintroduced itself as CAD Sciences at RSNA 2005. According to the company, the new name is intended to reflect the company's current focus on computer-aided detection (CAD) technology for breast and prostate magnetic resonance (MR) imaging and to more accurately portray its latest suite of CAD products that employ the company's proprietary Full-Time-Point analysis (ƒTP) algorithm. The company also announced that its ƒTP pharmacokinetic algorithm is now fully compatible with the Altaire high-field open MR system from Hitachi Medical Systems America, Inc. (Twinsburg, OH). The marriage of these technologies will provide the user with "the innovative approach of a four-compartment pharmacokinetic analysis algorithm" in an "open MRI system designed with excellent patient accessibility and comfort," the company stated. "The collaboration between CAD Sciences and Hitachi has led to the creation of a product solution that is optimized for the radiologist who wishes to provide patients with a comfortable and open imaging environment in conjunction with superior image processing capability to facilitate and streamline lesion diagnosis," said CAD Science's CEO, Ray Joslin. "ƒTP is the only commercially available product of its kind that calculates vascular permeability (PERM) and extracellular volume fraction (EVF) values for all pixels in contrast-enhanced MR studies." The privately held company, which designs and distributes CAD and MR angiography (MRA) software, also featured its Server2 and WorkSpace software platforms at RSNA as well as the VTRAC MRA solution with fully automated arterial and venous separation functionality. Zonare Medical Systems (Mountain View, CA) introduced several upgrades to its z.one ultrasound system, including two new transducers, calculation packages, and a program designed to automatically recognize and adjust for differences in body sound propagation. The new P10-4 transducer, for use with neonatal, infant, and pediatric patients, offers up to seven different frequencies, including harmonic imaging at 8.0 MHz received, two color Doppler frequencies, and three B-mode frequencies. The P4-1 small-footprint transducer was designed for abdominal and obstetric/gynecologic sonography and has nine available frequencies (Figure 1). This transducer also offers penetration up to 30 cm. 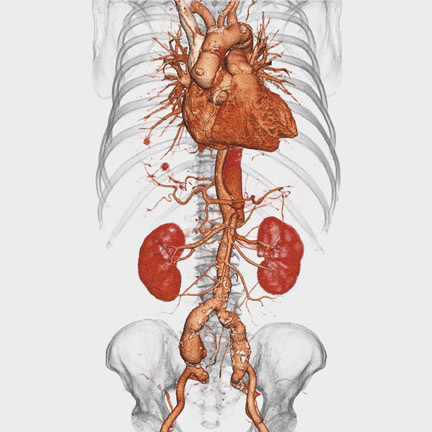 The two new calculation packages were developed to address abdominal and venous imaging. Both provide a protocol checklist with reports that include organ sizes, Doppler results, and a section for notes or comments. The third major upgrade announced at RSNA was designed to address the varying speeds at which ultrasound sound waves travel through the body. This feature provides the ability to automatically adjust the sound speed based on differences in a patient's body habitus, which, in turn, optimizes the clinical image. "The new upgrades further increase the value of the z.one system and demonstrate the power of Zone Sonography technology," said Donald Southard, President and CEO of Zonare. "The new transducers greatly expand the imaging capabilities and applications of the system, whether used as a full-featured, cart-based system or a premium compact system. More importantly, Zone Sonography technology has allowed us the ability to automatically adjust for each individual's unique body sound propagation and fully optimize the ultrasound image." Barco (Kortrijk, Belgium) used RSNA 2005 as a backdrop to introduce its first high-bright medical color display system with diagnostic luminance. According to the company, the new Coronis Color 3MP Diagnostic Luminance display system offers the benefits of a color display without compromising on gray-scale quality. With a calibrated brightness of 500 cd/m 2 , this system was designed to address the increasing needs of multimodality imaging and color-enriched applications. The display, which is based on PCI Express architecture, is bundled witha high-performance, ATI-powered display controller and includes the company's proprietary Uniform Luminance Technology. This technology was designed to correct luminance nonuniformities to DICOM standards. The Coronis Color 3MP Diagnostic Luminance also features the company's I-Guard sensor technology, designed to continually guard and adjust the luminance output of the diagnostic viewing area, and the company's intelligent Ambient Light Compensation (ALC) system, designed to ensure that the system remains DICOM-compliant under all lighting conditions. Barco also previewed an integrated suite of cardiac analysis applications as a work-in-progress. 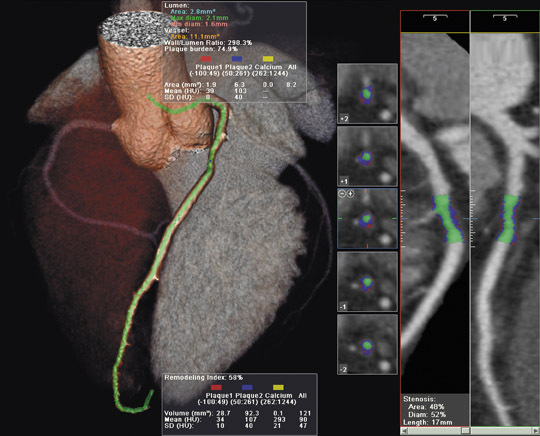 CardiaMetrix, a new suite of clinical application modules available within the company's Voxar 3D product, was designed to enable structural and functional analysis of contrast-enhanced computed tomography angiography (CTA) studies. It incorporates several clinical application modules, including coronary vessel analysis, calcium scoring, 4-dimensional (4D) cardiac analysis, and cardiac (left ventricular) functional analysis. According to the company, it delivers high-quality visualization of 2-dimensional (2D), 3D, and 4D images of the heart and provides tools for the automatic calculation of heart function parameters and quantitative analysis of cardiac anatomy, including the coronary vessels. "Our new CardiaMetrix suite reflects our commitment to the continuing development of clinical applications designed for, and integrated into, a PACS workstation environment," said Calum Cunningham, General Manager of Barco's Voxar Product Group. Cedara Software (Toronto, Ontario), a Merge Healthcare company, previewed a suite of software solutions for oncology diagnosis and treatment analysis as a work-in-progress at RSNA 2005. The Cedara I-Response software solution is being developed using a proprietary technology known as Functional Diffusion Mapping (fDM) for MRI. Designed for clinical assessment of response to cancer therapy, this technique allows the user to visualize changes in tumor tissue resulting from cellular mechanisms rather than only measuring tumor growth. According to the company, this method provides the potential to precisely monitor the impact of cancer therapies at an earlier point than is possible with current technologies. The company notes that it is hoped that by allowing clinicians to study tumor activity at both the cellular and anatomical level, this technology may provide a foundation for fast, efficient, and personalized cancer treatment. Cedara also introduced a new clinical product line, Cedara OncologyWorks, that includes functional components designed to assist with therapy planning and response assessment through positron-emission tomography (PET)/ CT fusion, MR-based functional diffusion mapping, tracking quantitative tumor measurements over time, and patient follow-up management. Eastman Kodak Company (Rochester, NY) featured enhancements to its CAD system for mammography and its CARESTREAM Radiology Solutions as well as a range of works-in-progress at RSNA 2005.
the ability to save log files from the system and report the number of markers per film and per case. Kodak displayed mammography CAD hardware capable of performing bone mineral density testing as a work-in-progress. Using the same film and X-ray unit as a mammogram, an X-ray of a woman's hand will be produced and scanned by the CAD digitizer. The software will automatically analyze the hand image to produce a report that will indicate the woman's bone density. The company also announced that it is developing digital CAD algorithms for use with full-field digital mammography and computed radiology (CR) systems. Kodak also previewed the DIRECT-VIEW CR Mammography Feature for the company's CR 850, CR 950, and CR 975 Systems, designed to allow the user to produce mammography images with the company's DIRECTVIEW CR Mammography Cassettes and new EHR-M screens. This optional feature will enable healthcare facilities to perform general radiography and mammography examinations on the same CR platform. The company also demonstrated enhancements to its CARESTREAM portfolio of information management solutions for mammography providers. New mammography-specific features for the CARESTREAM RIS (radiology information system) platform include automatic generation of patient letters and pending requests for annual recalls and a mammography information drawing tool with annotation capability. Enhancements to the PACS module include the ability to store original images and a single secondary capture image containing CAD markers for some digital CAD systems as well as support for additional mixed color and resolution monitor displays. "We offer an innovative portfolio of image capture, display, and information management solutions for mammography," said L. Jeffrey Markin, General Manager, Output Systems and Mammography Solutions and Vice President. "Our CARESTREAM Radiology Solutions platforms offer productivity-enhancing, mammography-specific features, and we also offer professional services that help mammography transition smoothly to a digital workflow." Vital Images, Inc. (Minnetonka, MN) showcased its ViTAL Solutions portfolio at RSNA 2005, featuring its Web-based ViTALConnect and enhancements to its Vitrea and ViTALCardia solutions. ViTALConnect is a full-featured Web-browser distribution tool designed to allow users to access 2D, 3D, and 4D advanced visualization images on any Web-enabled PC or notebook computer. It also features new software collaboration tools designed to facilitate interactive communication between radiologists and referring physicians, including the ability for remote users to restore the original Vitrea workflow and report. In addition, as part of a collaborative effort with Commissure, a New York-based early-stage workflow company, Vital Images has integrating technologies designed to consolidate status information and produce a real-time worklist. From this worklist, ViTALConnect users are able to launch directly into a clinical application workflow linked to a voice-driven report-authoring system and create a multimedia report. The company's cardiac image analysis solution, ViTALCardia, was presented with several recent enhancements including support for the large amount of data required for cardiac analysis, and enhanced enterprise-wide communication using customizable cardiac reports. ViTALCardia, which can be enabled on ViTALConnect, includes a variety of specialized components, including: CT Cardiac, General Vessel Probe, Cardiac Functional Analysis, VScore for coronary artery calcium scoring, and Automated Vessel Measurement for stenosis measurement. RSNA 2005 was an opportunity for the company's flagship product, Vitrea, to display its new CAD-driven workflow optimization features and highlight its integration into many PACS partners' solutions, including those from McKesson Medical Imaging Group (Richmond, BC), Eclipsys Corporation (Toronto, ON), Sectra (Linköping, Sweden), and DR Systems (San Diego, CA). The company also showcased its long-term relationship with R2 Technology, Inc. (Sunnyvale, CA), highlighting automatic lung nodule detection, automatic measurement of temporal change, and pulmonary arterial review. In partnership with Medicsight, PLC (London, UK), Vital Images also previewed an application for automated polyp detection and measurement that uses its InnerviewGI CT colonography system. With Confirma's (Kirkland, WA) CADStream, they presented an application for the automatic detection of breast lesions using MR imaging. "Our many partnerships underscore Vital Images' focus on growing, cultivating, and extending the reach of our comprehensive ViTAL Solutions portfolio," said company President and CEO, Jay D. Miller. "The breadth and depth of these relationships reflect the expansion of the requirement and extent of ViTAL Solutions in routine clinical review." IBM (Armonk, NY) featured its new personal health management portal, MyNDMA, that is linked directly to the National Digital Medical Archive (NDMA) from i3 Archive, Inc. (Berwyn, PA). When i3 Archive began the NDMA project 6 years ago, only 4 hospitals contributed records and had access to the database. Today, 24 hospitals and more than 300 doctors and researchers have access to more than 1 million digital mammography images. The new MyNDMA takes this national system one step further, allowing women around the country to manage their personal medical records, including digital mammograms and diagnostic test results, with secure storage of personal images and data and on-demand access from another hospital or radiology center. "Women battling breast cancer typically see several different doctors through the course of their treatment. Even though digital images make storage easier, before now there has been no easy way to transport digital images and patient data from doctor to doctor," explained Marisa C. Weiss, MD, President and founder of the nonprofit organization, breastcancer.org. "Giving these women direct access and control of their medical records isn't just convenient-it's empowering-and it can often be critical to the success of their treatment." Designed in collaboration with IBM, i3's NDMA securely collects mammography images and related breast data from doctors, hospitals, and radiology centers around the United States. With patient consent, these individual images and data can be made available to physicians and researchers seeking to develop better treatments for breast cancer and accelerate a cure. Powered by IBM's grid computing, researchers can search the archive on demand, giving them immediate access to the critical data needed to identify breast cancer patients for clinical trials in less than a day. "What i3 has been able to achieve with NDMA is a means to deliver better care to individual patients by giving doctors the technology resources and infrastructure needed to compare mammograms from year to year," said Carol Kovac, GM, Healthcare and Life Sciences Industry, IBM. "With MyNDMA, this data and information will, collectively, be able to enhance breast cancer treatment for women across the country and, we hope, will one day help find a cure for this disease." The NDMA data is made available to doctors, hospitals, and radiology centers through IBM grid computing using two IBM eServer xSeries systems. Data is cataloged and indexed using IBM's DB2 Universal Database and stored on IBM EXP300 Storage Expansion Units. Also at RSNA 2005, DOBI Medical International, Inc. (Mahwah, NJ) previewed the latest version of its dynamic optical imaging system designed for breast cancer diagnosis and management, ComfortScan (Figure 3). This system uses high-intensity, light-emitting diodes (LEDs) and gentle external pressure to identify vascular abnormalities or tumor angiogenesis in the breast. According to the company, this technology is designed to provide unique functional data that is unavailable with conventional mammography. The system was designed so that the patient stands in front of the machine while the breast is properly positioned. The breast holder then inflates, applying gentle pressure. The computer controls the light that is transmitted through the breast and recorded by a digital camera. The computer then processes the difference in the variations in intensity between tissues with angiogenesis and those without, and the results are available immediately. The ComfortScan system has CE Mark and UL designations for international distribution, and DOBI Medical is a certified ISO 9001:2000 and ISO 13485:2003 company. The system is not yet commercially available in the United States. Technology and Industry: RSNA 2005 review: Part 2. Appl Radiol.